stainless steel and it will not stain or retain unpleasant tastes or odors. Guaranteed products use FDA Approved Food Grade Material. cold or hot. Its Solid Packing makes sure that it would be a non-broken gift. The latest beautiful Stainless steel exterior, double walled vacuum construction can keep water and coffee hot and cold. Button press of top button to pour the coffee, .Wide mouth but microradian design,not easy to leak and easy to clean; Carafe can be utilized with ice for extra cold refreshment.Body remains cool to touch with hot liquids and is condensation-free with cold(handle may a little warm which is normal). 18/10 stainless steel liner,Improved beverage temperatures- Vacuum-sealed insulation helps retain hot and cold beverage temperatures for up to 24 hours to improve taste. 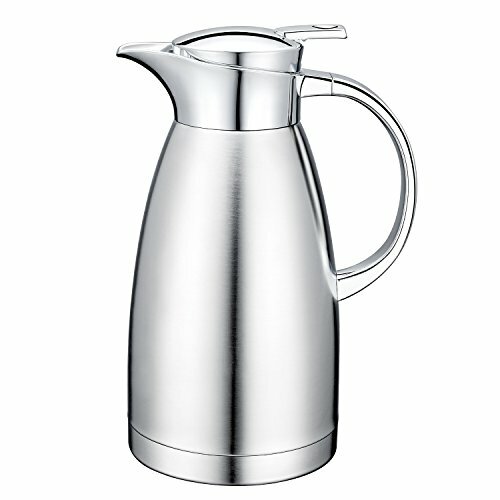 Convenient ★ Use for coffee, tea, milk, iced drinks, or even alcoholic beverages. Perfect for commercial and residential use at events, dinners, meetings, parties, & picnics. SERVICE: Guaranteed products use FDA Approved Food Grade Material and are backed by a 1 Year 100% Satisfaction Guarantee,and a 90 Day Money Back Guarantee. If for any reason you are unhappy, simply contact us for a quick resolution, return it for a 100% refund of your purchase price. If you have any questions about this product by Gabbay, contact us by completing and submitting the form below. If you are looking for a specif part number, please include it with your message.